The Wüsthof CLASSIC Cooks Knife is a high quality chefs knife made by the classic German cutlery manufacturer Wüsthof. It has a robust, classic design that performs well in a commercial kitchen or at home. It is truly a workhorse, and due to it’s weight and balance is a good choice for heavy duty kitchen work like chopping thicker meats and vegetables. The beefy 8 inch blade is forged with high-carbon steel to withstand a full day’s work, and the edge is hand-honed for maximum sharpness. This makes the more intensive work – chopping thick cuts of meat and dense vegetables – easier on your wrist and less time consuming. The full tang sits inside of a synthetic, triple-riveted black handle that’s ergonomic, non-slip, and certified for use in commercial kitchens. It feels secure and permanent – important traits for a working man or woman’s knife. Most importantly, the handle stills feels balanced enough to compensate for the heavy blade. As you approach the handle, you will notice a finger guard occupying the end of the forged blade. A finger guard protects your finger from slipping across the blade, and it also provides additional weight forward of the handle to increase balance. Which knife is right for you, a Wüsthof Classic or a Gourmet? This great little video shows you the difference between both models and who each might be best for. The blade is forged with high-carbon German stainless steel. The edge is hand-sharpened, so you’re left with a razor sharp but long lasting edge. Wüsthof’s forging and tempering process create a blade that’s resistant to chips or fragmenting, so you don’t have to fear diving right into the toughest squash, turnip, or rutabaga. The handle and finger guard make for a comfortable, safe, and confident grip. Since this is a blade that excels at more heavy duty work, having a heavy duty handle is a must. The ergonomic handle is made out of a synthetic material that looks nice and feels solid in the hand. For a knife of this heft, it’s remarkably balanced. The full tang and riveted handle give it enough weight behind the bolster, with the finger guard creates a perfect tipping point between handle and blade. While it doesn’t detract from it’s effectiveness, the blade will not wow you with it’s beauty. The design is rather plain overall – no Damascus pattern, no watermarks, just a classic style blade and simple black handle. Also, it was shipped in a flimsy cardboard sheath. The heft of the Wüsthof CLASSIC Cooks Knife can require a brief adjustment period. The knife is well balanced, but it is heavier than the other best chef knives of this size. The most outstanding feature of the Wüsthof CLASSIC Cooks Knife is the heavy duty blade. The extreme sharpness and above average weight gives this blade the panache to easily chop the thickest meats and vegetables. Plus, the finger guard and thick synthetic handle create enough balance and grip to match the prowess of the blade. Wüsthof CLASSIC Cooks Knife – This is a classic all-purpose chefs knife that could find a place in anyone’s kitchen. It’s also the least expensive knife featured in our guide. 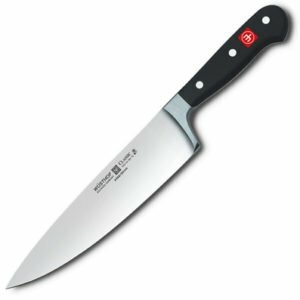 This is one of the best chef knives for new chefs searching for the right knife to start with or an experienced chef wanting to augment their collection.